Jack Rossi's "Beauty and the Beast"
For the second year, ECO-Visions is presenting an outdoor sculpture exhibit at King Farm, a Vermont Land Trust property in Woodstock. This year's theme, "Intersections: Our Natural and Synthetic Worlds," was inspired in part by the five trillion pieces of plastic floating in the world's oceans. Sixteen participating artists investigate this idea in the exhibit. ECO-Visions was established to explore creative solutions to environmental problems through art. The initiative came from Sharon Earn and Jack Rossi, who have worked together as volunteers on various art- and design-related community projects that explore sense-of-place and quality-of-life issues in their communities. Earn is an environmental designer who divides her time between Toronto and Woodstock. The latter is the home of Rossi, a landscape architect. "We started ECO-Visions with the goal of engaging artists in exploring many of the environmental problems we are facing," says Earn. "We hope, through these art exhibits, to raise awareness of these issues, to generate new perspectives and to encourage community engagement in imagining alternative solutions." She and Rossi see art as a means to help people visualize environmental threats and challenges. A next step is to develop community conversations and creative solutions. Last year, as Earn and Rossi began discussing the concept of ECO-Visions, Charlet Davenport, director of Woodstock's annual Sculpturefest, "offered this site to put together an environmental show," Rossi says. In short order, they mounted "Sense of Place: Built and Natural Environments." The place-based theme inspired some artists to create work inside old outbuildings, including a camera obscura. This year's ECO-Visions exhibit sites sculpture throughout King Farm. In "Begging for the Earth," Barbara Bartlett has incorporated part of an exterior wall of one of the farm's outbuildings. It bears a color "key" to various recycled plastic bags, cluing viewers in to their original sources, such as a grocery store. Bartlett used the bags themselves to make woven plastic bowls, which she based on the idea of "Buddhist begging bowls and our disregard for the environment by our thoughtless and habitual use of plastic," she explains. Earn says Bartlett's work exemplifies a conundrum of modern life and technology. "There's a bit of a conflict," she says. "Is it good or bad? It's recycled. It's reusable." Davenport's "Scarborough Pots" are mixed-media totems consisting of plastic flowers, planters and other items. She notes that the English ballad "Scarborough Fair" describes a series of impossible tasks; it has been seen as an allegory for the great plague of the late middle ages. Near this installation, "Urban Tipi #2" by John Bieling resembles a dwelling that might be found in the shadow of an overpass or in an abandoned lot. Old oak flooring and corrugated steel, copper, plastic and slate make up the cone-shaped habitat, equipped with a small window into its dark interior. Bieling recalls "a time when indigenous peoples of the land lived in harmony with nature and the seasons. Some today live in rudimentary [synthetic] structures as a way to survive in urban settings," he writes in his artist statement. Expansive meadows and a path through a forested area beckon audiences to explore the land. Rossi's "Beauty and the Beast" (tree, red plastic shards), sited along one such path, tests the line between the beautiful and the insidious. 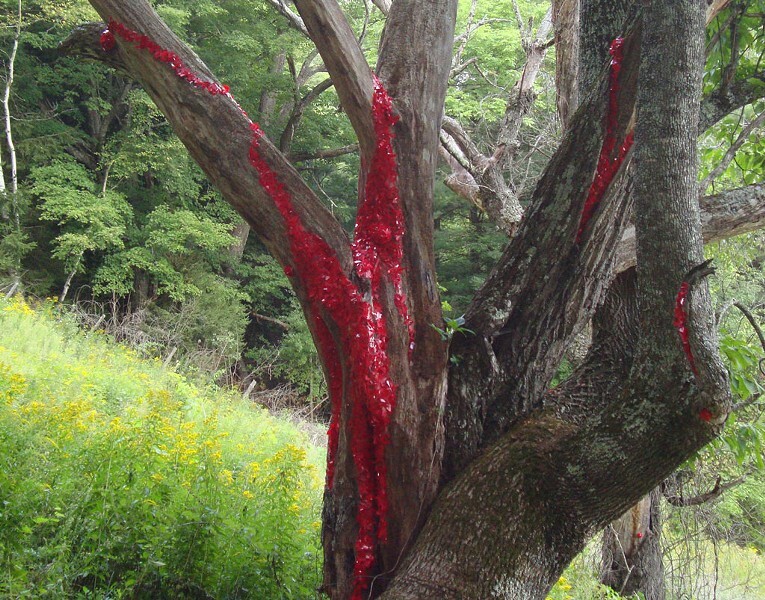 Small pieces of red plastic adorn a huge ash tree, resembling an open wound. A parasite appears to be taking over the tree, a reference to the accumulation of plastic in the environment. While the red plastic is surprisingly beautiful against the tree's bark, it has the potential to strangle nature. Earn and Rossi are already planning where they will take ECO-Visions from here. They intend to hold various central Vermont events to introduce the public to the art and the environmental issues it addresses. The two are no strangers to engaging the public, as their professional work and personal interests often involve such community discussions. Feasible solutions to environmental problems interest them most, they say. Earn and Rossi believe that communities will decide their own future. ECO-Visions' current exhibit provides a provocative backdrop for talking about how we might live with those changes. ECO-Visions' "Intersections: Our Natural and Synthetic Worlds" opens on Saturday, September 5, 4 to 7 p.m., at King Farm in Woodstock, and runs through November 25. ECO-Visions opens concurrently with Sculpturefest. A walking trail connects King Farm and the Sculpturefest grounds on Prosper Road. The original print version of this article was headlined "An Outdoor Sculpture Exhibit Takes Its Cue From Plastic Pollution"